I read this article a while ago, and was initially thrown off by the title, and even the opening line. I proceeded to be completely drawn in by his message. Despite having read it months ago, I thought of it again recently, and figured I should share it. In marriage, losing is letting go of the need to fix everything for your partner, listening to their darkest parts with a heart ache rather than a solution. It's being even more present in the painful moments than in the good times. It's finding ways to be humble and open, even when everything in you says that you're right and they are wrong. It's doing what is right and good for your spouse, even when big things need to be sacrificed, like a job, or a relationship, or an ego. It is forgiveness, quickly and voluntarily. It is eliminating anything from your life, even the things you love, if they are keeping you from attending, caring, and serving. It is seeking peace by accepting the healthy but crazy-making things about your partner because, you remember, those were the things you fell in love with in the first place. It is knowing that your spouse will never fully understand you, will never truly love you unconditionally—because they are a broken creature, too-and loving them to the end anyway. 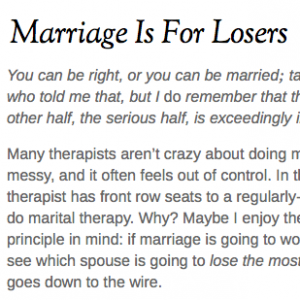 It's a great article, and certainly has some pointers for how I could improve as a spouse.